The Greylag Geese (Anser anser) - also simply known as Grey Geese - are large migratory geese with a wide range in the Old World. The "lag" portion of the common name was derived from the fact that they are one of the last geese to migrate ("lagging behind other migrating geese"). 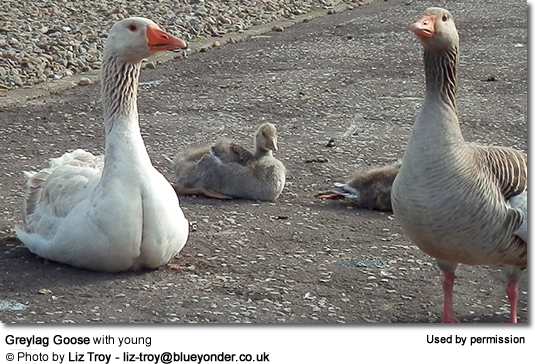 Many farmyard geese were bred from Greylag Geese. 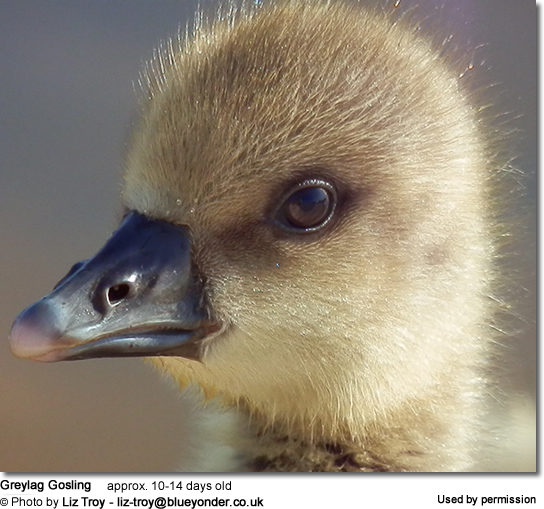 The well-known behavioral scientist, Konrad Lorenz studied the phenomenon of imprinting on this species demonstrating that Greylag chicks would bond with / regard as parents whatever they laid their eyes on first after hatching. Range: Breed in Iceland, Scandinavia and Finland and migrate to the British Isles for the winter. Range: Breed in southeastern Europe, Asia Minor and USSR from the Urals east to Manchuria; migrate to northwest India, Burma and south China for the winter. 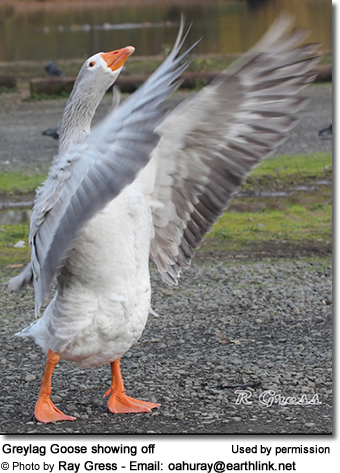 Greylag Geese occur naturally in Eurasia, North Africa, Greenland, the Middle East, continental Asia and Japan. They occasionally visit North America and have been introduced to the Falkland Islands (Malvinas). The geese are fully migratory, moving south or west for the winter. Some populations found in the temperate regions of northwestern Europe (i.e. Scotland) are largely resident (non-migratory), but may disperse locally making only irregular movements in particularly icy winters. After the breeding season, birds will undergo a complete simultaneous replacement of all their flight feathers, leaving them unable to fly for about a month - until the new flight feathers have grown in. The first ones to undergo this molt are typically non-breeding juveniles, non-nesting adults and adults whose nests have been destroyed. This molt typically lasts one month and during this time, they are particularly vulnerable to predation. Prior to this molt, large flocks will undertake molt migrations to areas that offer plenty of feeding opportunities and safe roosting sites. They occupy a wide variety of habitats associated with water in open country. Their breeding territories include many European countries. However, they no longer breed in southwestern Europe. Breeding birds nest near streams, saltmarshes, river flood-plains, reedy marshes, grassy bogs, flooded grasslands, sedge or heather moorland, arctic tundra, steppe, semi-desert, reed-lined freshwater lakes, and estuaries, or on isolated islands. Nests are typically situated near feeding sites, such as meadows, open grasslands, stubble fields and newly sown cereal fields. In the autumn (before migration), they also frequent agricultural land (such as sugar-beet, maize and cereal fields). They occur from sea-level up to 7,500 feet or 2,300 meters. After the breeding season is completed, large groups of them (up to 25,000 birds) migrate to their wintering ranges. Icelandic populations winter in Scotland. Scandinavian populations mostly winter in France and Spain. Central and southern European populations winter around the Mediterranean. They winter on lowland farmland in open country, marshes, swamps, lakes, reservoirs, coastal lagoons, flooded grasslands and estuaries. Afghanistan; Albania; Algeria; Argentina; Armenia; Austria; Azerbaijan; Bangladesh; Belarus; Belgium; Bhutan; Bosnia and Herzegovina; Bulgaria; China; Croatia; Czech Republic; Denmark; Estonia; Faroe Islands; Finland; France; Germany; Greece; Greenland; Hungary; Iceland; India; Iran, Islamic Republic of; Iraq; Ireland; Israel; Italy; Japan; Jordan; Kazakhstan; Korea, Republic of; Kyrgyzstan; Lao People's Democratic Republic; Latvia; Lithuania; Luxembourg; Macedonia, the former Yugoslav Republic of; Malta; Moldova, Republic of; Mongolia; Montenegro; Morocco; Myanmar; Nepal; Netherlands; Norway; Pakistan; Poland; Portugal; Romania; Russian Federation; Serbia; Slovakia; Slovenia; Spain; Sri Lanka; Sweden; Switzerland; Syrian Arab Republic; Tajikistan; Tunisia; Turkey; Turkmenistan; Ukraine; United Kingdom; Uzbekistan; Viet Nam. Greylag Geese are large and bulky geese, measuring 30 - 35 inches (75 - 90 cm) in length, with a wing length of 16.2 - 18.9 inches (41.2 - 48 cm). The bill is about 2.5 - 2.7 inches (6.4 - 6.9 cm) long. 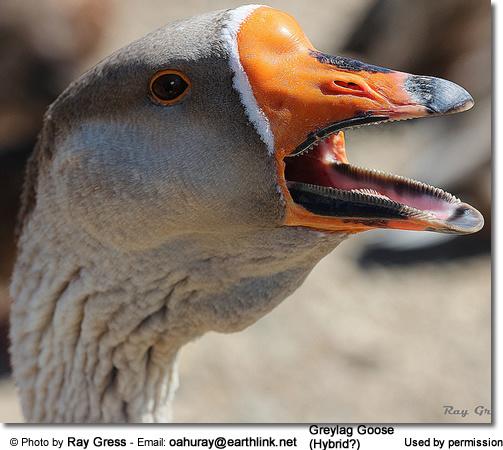 Greylag Geese weigh between 6 - 8.4 pounds (2.7 - 3.8 kg). Males are generally larger than females, particularly so in the eastern subspecies rubirostris. The males weigh 7.7 - 8.4 pounds (3.5 - 3.8 kg) and females 6 - 6.8 pounds (2.7 - 3.1 kg). They have thick, long necks and large heads and bills. The legs and feet are pink and the big, deep-based bills are orange or pink in color. Males and females look alike, except the male's larger size. Juveniles lack the black-speckled belly of the adult. 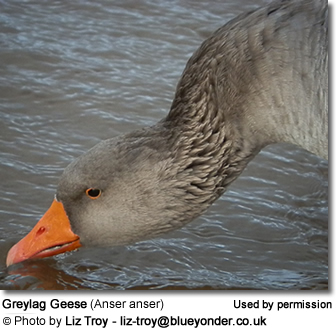 Greylag Geese can usually be easily identified in the field; they are bigger, bulkier and paler than other grey geese. 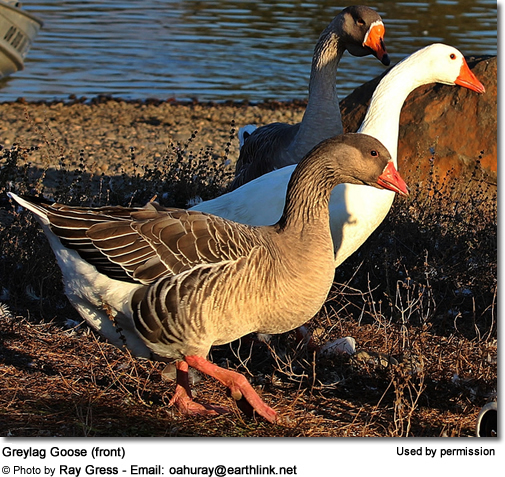 Their pink legs would rule out any species other than Pink-footed Goose. 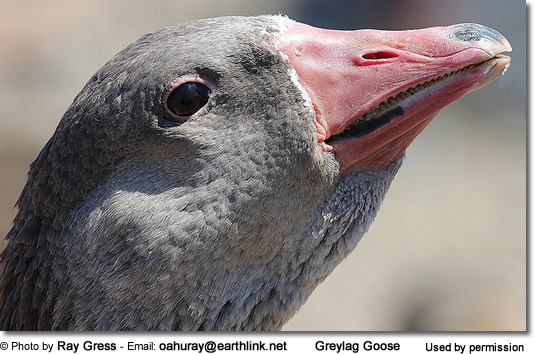 The Pink-footed Goose has a dark brown head and a much lighter neck. 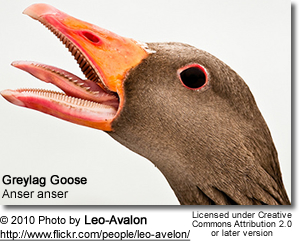 The White-fronted Goose has a characteristic white base along the beak. The Barnacle Goose has black on top and front with a white face. 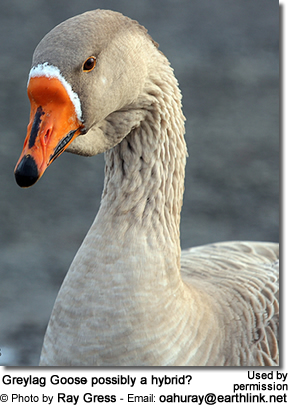 The Bent Goose is smaller and has a dark face with a small white collar in the neck. 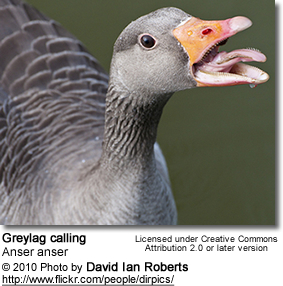 The Greylaggers Geese make loud cackling calls, kiYAAA-ga-ga, that sound very much like calls made by domestic geese. 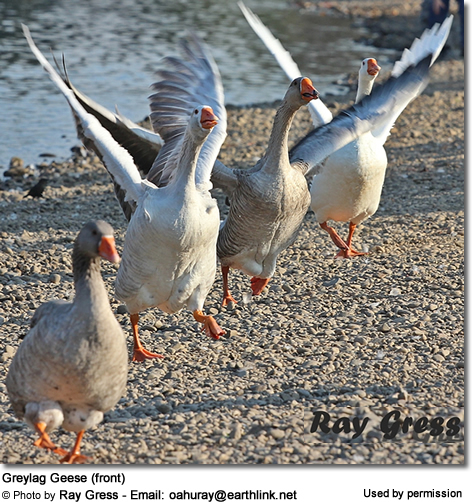 Greylag Geese typically reach reproductive maturity when they are about two years old and commence breeding during the spring-summer breeding season of the third year. The Eastern Greylags breed in loose colonies between April - May and the Western Greylags usually commence early May in Iceland and late April in Scotland. The nests are shallow construction of plant matter, with a depression in the middle that is lined with down and feathers. The nest is placed on the ground, among reed beds, at the base of trees, under bushes, in sheltered hollows, on isolated wooded islands on lakes or along the coasts, as well as on vegetation in rivers. They nests may be fairly concentrated within small areas. On small islands, for example, they were recorded to nest within 36 feet (11 meters) from each other. The average clutch consists of 4 - 6 white eggs, although as many as 10 - 12 can be laid. The young hatch after about 27 - 29 days. 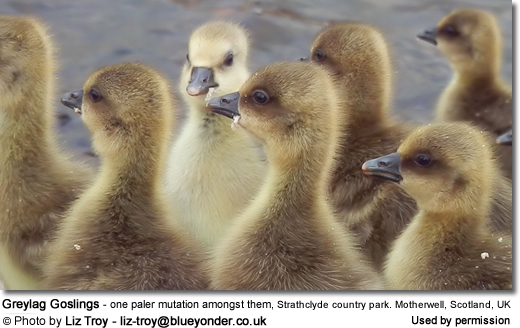 Captive Greylag Geese have hybridized with domestic geese. 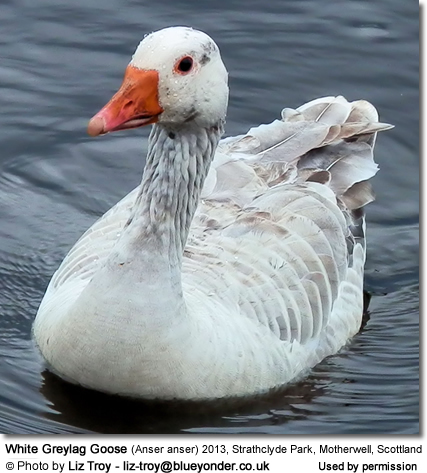 Wild Geese occasionally hybridize with escaped geese and with feral / hybrid greylag geese. In Germany and the Netherlands, feral Greylag Geese have adapted to living in urban wetlands and gravel pits, where they are mostly sedentary (non-migratory). 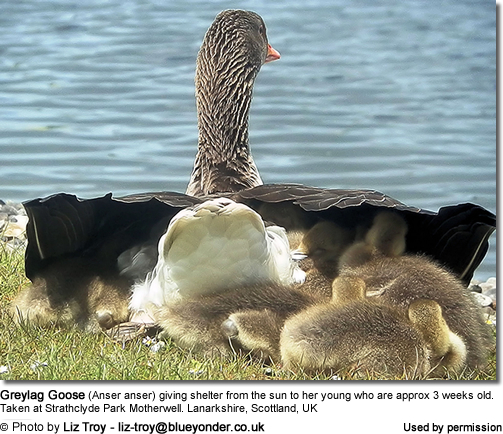 Greylag Geese mostly feed during the morning and evening, although non-breeding birds may also feed at night. They consume wide variety of plant material, including grass, roots, shoots, leaves, stems, seed heads and sprouts and fruits of other herbaceous marsh vegetation, aquatic plants, and agricultural grain and potatoes (especially in the winter). We all enjoy waterfowl and many of us offer them food to encourage them to come over and stay around - and it works! Who doesn't like an easy meal! However, the foods that we traditionally feed them at local ponds are utterly unsuitable for them and are likely to cause health problems down the road. Also, there may be local laws against feeding this species of bird - so it's best to check on that rather than facing consequences at a later stage. Foods that can be fed to Ducks, Geese and Swans to survive cold winters and remain healthy when food is scarce in their environment. Please note that feeding ducks and geese makes them dependent on humans for food, which can result in starvation and possibly death when those feedings stop. If you decide to feed them, please limit the quantity to make sure that they maintain their natural ability to forage for food themselves - providing, of course, that natural food sources are available.